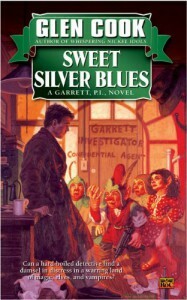 Sweet Silver Blues by Glen Cook is the first of the Garrett, P.I., novels set in Cook's pseudo-urban/traditional fantasy world. 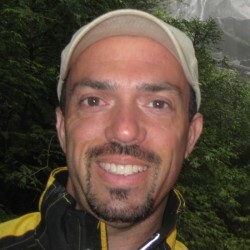 Glen Cook is perhaps best known for The Black Company series. Unfortunately, Sweet Silver Blues follows in that series' knack for introducing confusion and leading the reader on such a herky-jerky path that it's nearly impossible to see how one dot is connected to another. That being said, it's not all bad. Cook presents a colorful array of bruisers, Garrett is about as moody and cynical as any private investigator has a right to be, and the case is solid. But the pursuit of clues is a slow one as Garrett and his motley companions travel abroad to the Cantard, a sort of front where a war is being waged. Monsters abound, including some of the more well-known types—elves, centaurs, unicorns, and vampires—along with some that are new, like the grolls that accompany Garrett. There's plenty of backstabbing and double-crosses, and a climatic, no-hold's barred finale. But it takes a long time to get there. The novel weighs in at a modest 311 pages; it could have been about 50 pages shorter. Although I was not completely satisfied with the storytelling, I did finish the novel if that means anything. I also only read the first of The Black Company books. I think this series is going to get the same consideration. I think I have to conclude that me and Cook are just not compatible.